White kazoo and white winters – may sound like chalk and cheese, still they make a deadly combination when combined in unison. 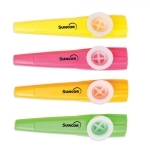 Custom white kazoos – offered here is a real pleasure for kids who are finding ways to toot their energy during winter holidays. 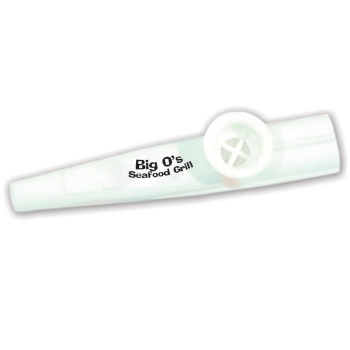 This white kazoo easily gels with the theme of white holidays and kids can use it during their regular playtimes or during some school /community functions. 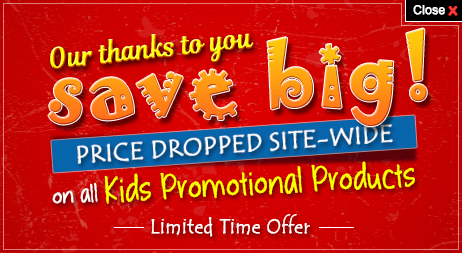 Marketers who are targeting kids can hand out logoed promotional white kazoo through churches, kid’s choir programs, winter holiday programs, etc. A personalized white kazoo will be retained by most of the kids because it’s a precious toy for them, which encourages them to blow their heart out and announce to the world that they are happier! 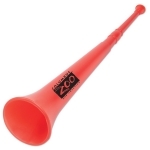 Product size 8. Imprint area - 2" X 1/2". Imprint Area : 1" X 1/4"
The design looked great! I'm really excited to show them off to our wedding guests! Everyone I spoke to was very friendly and my order arrived in a very timely fashion.